In 2007 Alexandra Huddleston spent 10 months in Timbuktu, Mali documenting the rich and centuries old tradition of Islamic scholarship in the city. The home of hundreds of thousands of manuscripts, Timbuktu holds a special place in the history of Islamic and African culture. Huddleston was welcomed into classrooms, libraries and Islamic sanctuaries to document this unique and vibrant intellectual tradition. Her remarkable pictures show a community of intellectuals, teachers and students engaging in an enlightened educational system inclusive of women and multiple ethnic groups in the region. While Huddleston was quick to perceive the precariousness of the survival of these traditions in the modern world, she could never have anticipated the terrible events that were coming to Timbuktu. In April of 2012, the city was overtaken by fundamentalist rebels, affectively ceasing the way of life that Huddleston had been fortunate enough to capture in her photographs. Huddleston’s project was particularly well suited for a book, but after struggling to find adequate publisher backing for a year, she made the decision to self-publish. It's a decision that many photographers are coming to these days, and one that's easier to make with the plethora of new resources to realize a book project. Even so, self-publishing a photobook can be exceptionally challenging. We see number of creative and breathtaking self-published photobooks at photo-eye, but also many that fall short. 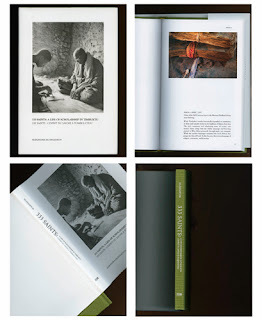 Huddleston's book is a fine example of the benefits of a photographer-designed photobook; 333 Saints: A Life of Scholarship in Timbuktu is not simply a vehicle for Huddleston's photographs, but through the incorporation of textual elements that draw in history and Huddleston's personal experience, it is itself a document of cultural scholarship. Learn more about Huddleston's book here. I am happy to announce the publication of my photography book 333 Saints: A Life of Scholarship in Timbuktu / 333 Saints : l’esprit du savoir à Tombouctou. Although this story has a happy ending, make no mistake, the path to the decision to self-publish was filled with frustrations and disappointments. 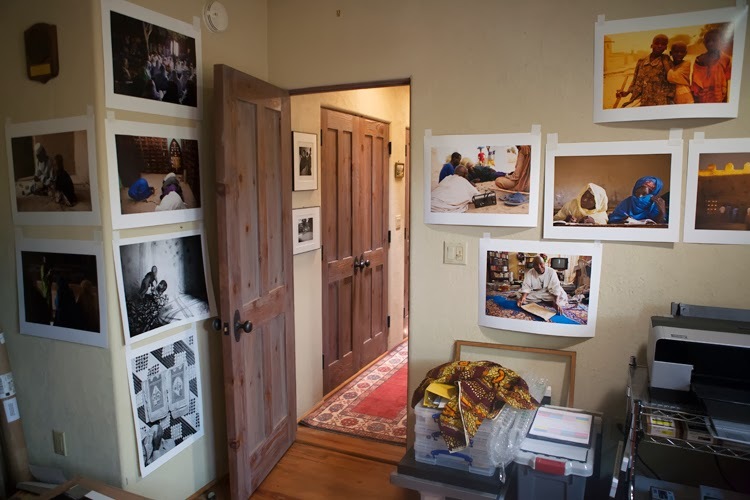 Although photographs from the body of work from Timbuktu were readily accepted into two of the most prestigious archives in the US, in five years I found no one willing to truly back the publication of a book (i.e. make a financial commitment). At least four publishers were very willing to publish the book—provided I find $20,000 (or more) for them to do so. I also received so many referrals on the other people who would surely help, that I began to feel as though I was on a merry-go-round. Last summer, I decided to stop the cycle of frustration. I stopped submitting my manuscript. I stopped applying for contests, grants, reviews, and shows. Instead, I decided to spend my time and money on projects that had concrete results and that were all aimed at building toward self-publishing 333 Saints. This was my calculation: it would take a lot of work, but by self-publishing I could raise less money, have full control over the book, keep all rights to the work, and I could keep all the profits (if there were any). Financially and artistically self-publishing seemed like the right choice. This proved to be true. Self-publishing even a small book (and at 96 pages, 6” by 9”, 37 photographs, 1 lb 1 oz, 333 Saints is a small book) is an enormous project. These last six months it required around eight to nine hours of work a day, six to seven days a week. Moreover, the less money you have (I had very little) and the more jobs you take on yourself (I am the photographer, writer, image specialist, editor, book designer, video editor, pre-press image proofing specialist, on-press proofing specialist, fund-raiser, distributor, AD woman, and publisher for this project), the more of your time the work will take. So, gaining at least a bit of experience through a few smaller projects definitely increases your chances of success. My first step toward publishing 333 Saints was the online self-publication of a five-minute video that linked my photographs to the tragic events that occurred in Mali last year. Over 3000 people viewed the short piece. It received write-ups in a few heavily trafficked blogs. My audience increased exponentially, and I began to understand the power of social media and how essential it would be to successfully self-publishing -- especially to successfully running a crowd-funding campaign. My second step was the publication of my first book, Lost Things, (that’s right, 333 Saints is a second book!) a collaborative, hand-made limited edition of 50. 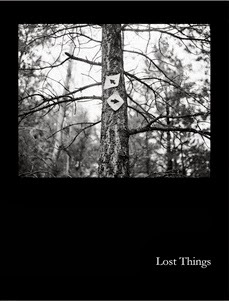 With only 20 pages, 5 photographs and 3 poems (the poems are by my brother Robert Huddleston), Lost Things was a very manageable work on which to hone my publishing skills. It allowed me to successfully experience essential steps in the book making process like: creating a publishing budget, tracking sales and profit, running a small Kickstarter, buying and using an ISBN number, creating my own imprint (The Kyoudai Press), exporting my InDesign files into a high-quality PDF, pre-press proofing a book, printing and binding and signing and shipping 50 small books, building a website and Facebook page for the imprint… I’m sure the list is longer, but somehow soon after you’ve successfully self-published, the pain of the process begins to disappear from your memory. If I hadn’t experienced all these tasks at least once for my smaller book, the work for 333 Saints may well have been unmanageable. Overall, I’ve been having a lot of fun. It’s wonderful to get the book you want rather than the book the publisher thinks will sell! Did you know that Walt Whitman self-published Leaves of Grass? Did you know that Laurence Sterne self-published the first volume of The Life and Opinions of Tristram Shandy, Gentleman? Do you know how much fun it is to choose the color of your book’s head and tail bands or the type of paper for the dust-jacket?! However, undoubtedly, there is one step in self-publishing that is a crazy, stressful, roller-coaster, and that is the crowd-funding campaign. My campaign was a grass-roots endeavor. There was no silver bullet and no angel donor (though there were many wonderfully generous backers to whom I’m eternally grateful!). To make my Kickstarter succeed, I emailed everyone in my address book personally (over 2000 people). I posted original content on Facebook daily. I contacted strangers via twitter who were posting about manuscripts or Timbuktu. I got every alumni list, forum, or Facebook page that I was connected with to post about my campaign. I got two pieces of external press and (more importantly) used them to my advantage on social media. My timing was also good since in May, Mali and Timbuktu were frequently in the news. This was fortunate because I overestimated what my personal network would bring in, but I underestimated how much interest complete strangers would have in the work. Crowd-funding is key to successfully self-publishing; not only because it provides you with the funds to make your books, but also because it creates a strong platform for your future marketing and distribution campaigns. This is a major reason why established art organizations (like Aperture) are getting into crowd-funding. Whether or not they actually need the money, they have realized the marketing value of a crowd-funding online “event.” For example, I set-up five book talks for this fall from the contacts I made at the time of my campaign. For me, crowd-funding was an intense crash-course in leveraging the power of social media. In retrospect, the campaign would have certainly gone more smoothly if I had built a stronger online following ahead of time. Since it’s so important, what other advice can I give about crowd-funding?? Be prepared to have days when you hate your friends and days that you are filled with universal love. Eat properly, get enough sleep, exercise a bit, otherwise you’ll get an ulcer. Do your research ahead of time. Look at other campaigns for projects similar to your own. Contact the people who ran them and ask advice. Also, look at campaigns for projects that are different from your own in order to grab fresh, new ideas that other photographers haven’t used. Think less in terms of getting donations and more in terms of pre-selling your books. Most successful photo book campaigns that I’ve looked at (including my own) are actually pre-selling books and prints. Indeed, half of my edition is already earmarked due to my Kickstarter. Creating special “Kickstarter editions” and special pricing on prints makes the campaign a unique event during which your fans can help you while at the same time getting something rare, and (potentially) valuable in the future. What they say is true: it is a full-time job. There is one last piece of advice that I suspect many will not take: don’t think of self-publishing as a stop-gap measure that you’re suffering through until a “real” publisher picks up your work. If you do, you’re limiting your financial and creative potential. I now think of myself as a real publisher. My imprint, The Kyoudai Press, has published three books in the last twelve months (true, two have been hand-made limited edition artist’s books, but nonetheless!). My fourth book is already very well planned, and a handful of other books of various sizes are in the conceptual stages. I’m certainly willing to collaborate with other publishers. I’m also willing to publish the work of other artists and writers for books that are made in collaboration with my own photography. Alexandra Huddleston is an American photographer who was born in Freetown, Sierra Leone, and grew up in the Washington, DC area and in West Africa. She holds a BA from Stanford University and an MS in broadcast journalism from Columbia University. Her work has been published in The New York Times, Zeit Magazine, and National Geographic Explorer, and exhibited in group and solo shows worldwide. Among other honors, she has received a Fulbright Grant for her photographic work. Her prints are in the permanent collection of the US Library of Congress Prints and Photographs Division and the Smithsonian Institution National Museum of African Art Eliot Elisofon Photo Archives. In 2012 Huddleston published the collaborative artists’ book Lost Things under her own imprint, The Kyoudai Press. 333 Saints: A Life of Scholarship in Timbuktu is her second book and Searching for Lost Time: Night Photographs from Timbuktu is her third. Congratulations. I self-published a book of photos I took in China after several rejections. Best move I ever made.